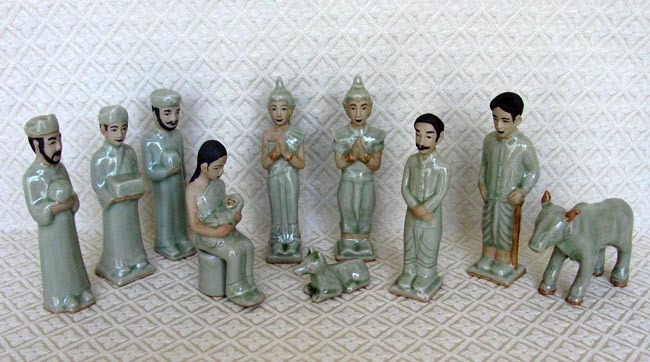 This ten-piece Nativity set was handcrafted in Northern Thailand at the Mengrai Kilns in Chiang Mai. The fired stoneware figures are finished in a green Celadon glaze. This set includes Joseph, Mary holding baby Jesus, two angels, a shepherd with staff, a cow, a dog, and 3 kings. The angels wear the pointed Chada hat, a traditional Thai headdress denoting royalty or deity. The shepherd wears a sarong. The Joseph figure measures 5.25 inches tall. Celadon is a high-temperature fired stoneware with a subtle random crackle surface. The glaze is composed of silt from a rice paddy field and wood ash. The pieces are fired in a green celadon color in a reduction process at a temperature between 1,260 and 1,300 degrees Celsius. The process is thought to have originated about 2000 years ago in China and is a specialty of Northern Thailand. The traditional process continues today. It is a manmade attempt to duplicate opaque jade, since jade is strong and beautiful, and tradition suggests it brings the owner good luck and success.